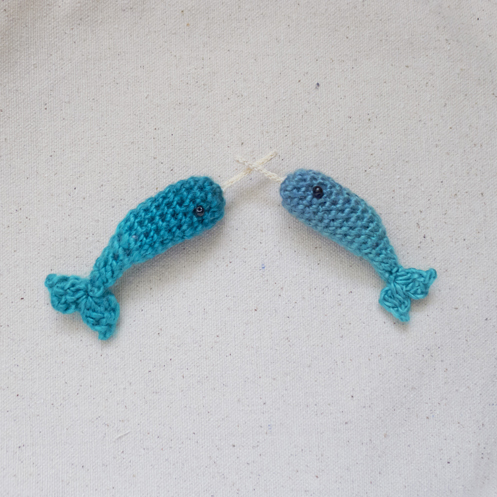 The narwhals are tiny, and they are also very apologetic today, because this pattern is WAY overdue! Remember this giveaway months ago? Where I asked everyone what animal I should make for a new amigurumi pattern? This is it. So sorry about the massive delay! Here’s Mike’s hand, as a size reference. I’m quite happy with how the tusk turned out. I was just going to glue a toothpick to it and call it a day, but thought I’d give cotton thread a try first. And it worked! So it’s crocheted, then stiffened with acrylic medium. Stitches used: magic ring, chain (ch), single crochet (sc), double crochet (dc), 2 single crochet together (2 sc tog), 2 double crochet together (2 dc tog), slip stitch (sl st). 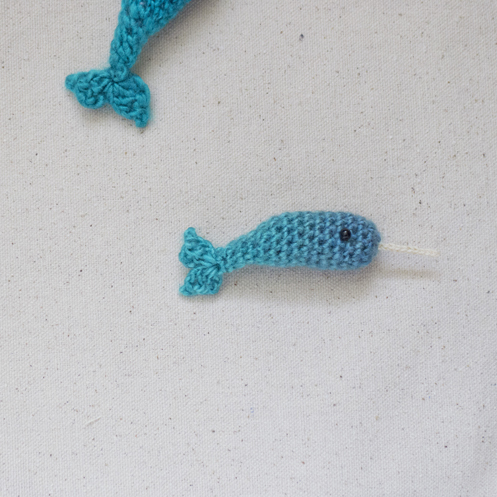 Narwhal body is crocheted in rounds in one piece, including the tail. Repeat Rnd 3 until piece measures about 1.5 inches or longer if desired. Then begin to decrease into the tail part. Stuff body firmly. I like to use yarn ends. Tail: ch 3, 2 dc tog in the base of the ch 3 just made, ch 2, sl st in second ch from hook, ch 3, sl st in the base of the same ch 3 in the beginning of row, ch 3, 2 dc tog in the base of same ch 3, ch 2, sl st in second ch from hook, ch 3, sl st in base of same ch 3. Fasten off, weave in ends. 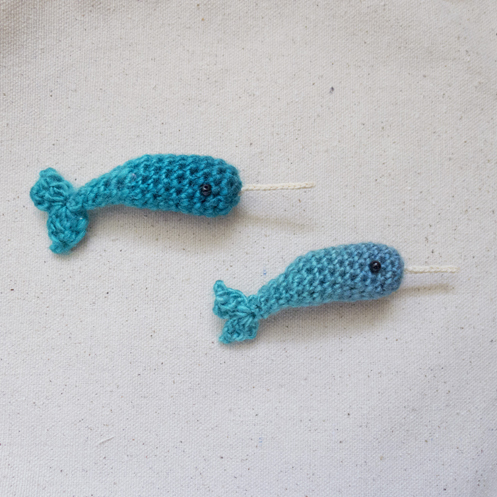 Tusk: Attach crochet thread to head of narwhal. With smaller hook, ch 13, sc in second ch from hook, sc in each ch to end of chain. Fasten off, weave in ends. With small brush (or finger), apply acrylic medium to cover entire tusk. Let dry, then apply another coat. 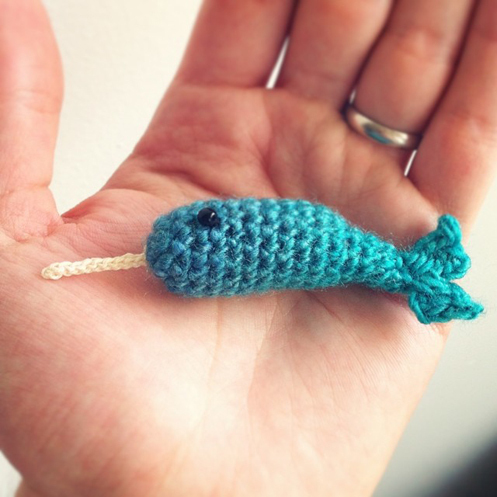 And here we have it, the tiniest narwhal, unicorn of the sea. If you have any trouble with the pattern please don’t hesitate to drop me a note! I can’t wait! He’s going to be soooo cute! I know just the place for him! Adorable, and brilliant idea for the tusk! 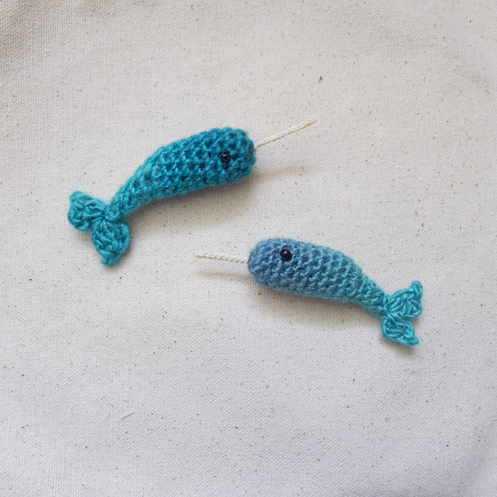 I’m no crochet artiste, is there any chances you make things like this for sale? Thanks! thank you for visiting, William! I do take custom orders through my Etsy shop. You can either send me an email or Etsy message with what you’d like to order and I can let you know the details. Here’s the link to my shop: //www.etsy.com/shop/genuinemudpie Thanks!